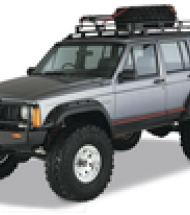 EAD Offroad carries an extensive line of parts and accessories for your 84-01 Jeep Cherokee XJ. With names you can trust like aFe, Airaid, Alloy USA, ARB, Daystar, Fox, GenRight, Gobi, Hypertech, JcrOffroad, J.W. Speaker, Lubelocker, Manaflow, Olympic 4x4, OR-Fab, OMIX-ADA, PIAA, Poison Spyder Customs, Rugged Ridge, Richmond Gear, Riddler, Superchips, Smittybilt, Synergy and more you can't go wrong. If you can't find what you are looking for give us a call at (888) 512-0170 or send us an email.